Styled in beautifully contrasting matt white gold and polished 9ct rose gold, this elegant men's band is finished with a delicately sparkling diamond in a chic square setting. 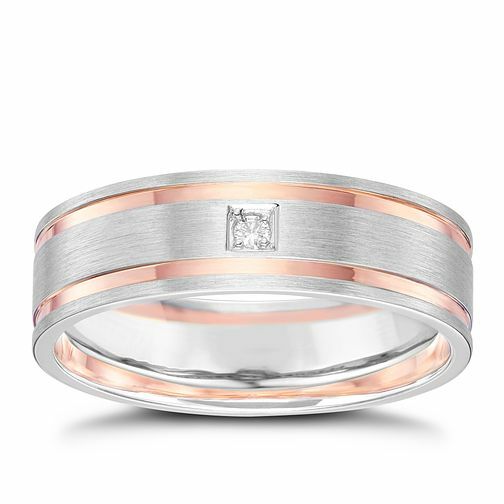 9ct White Gold & Rose Gold Band is rated 5.0 out of 5 by 3. Rated 5 out of 5 by Anonymous from Beautiful ring This is a beautiful ring that feels good on, looks expensive and is great quality. The only issue I’m have is how easy it is getting scratched. Not used to rings but have only worn it a couple of weeks and it shows the scratches quite a bit. Both on mine and my partners. We still love the ring though.